Monday (June 26th) is my 48th birthday 😯 . This post is not about me and my 48th birthday. Thank goodness, right? I wouldn’t do that to you, ha ha. It is about something I LOVE though. RAINBOWS. I completely freak-out when ever I see one, don’t you? I just can’t get enough color lately, but I think this idea might help fill the void. 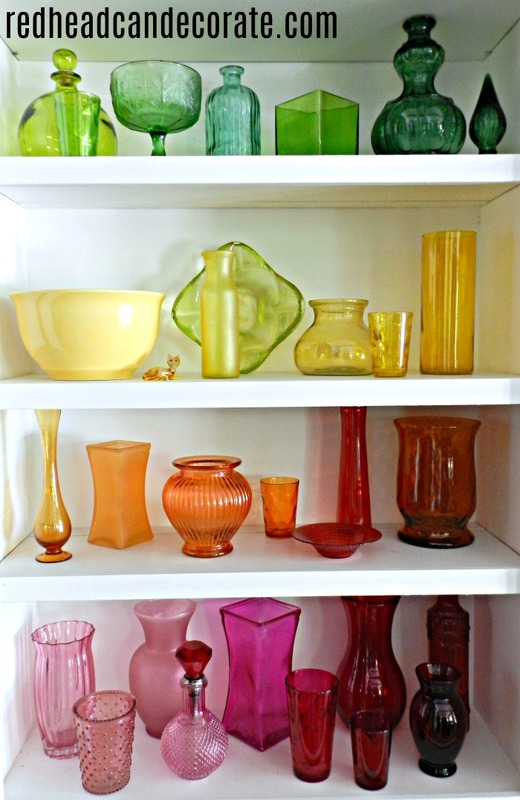 Welcome to my colorful “Thrift Store Rainbow Ombre Glass Display”. It just might be my most favorite project ever. 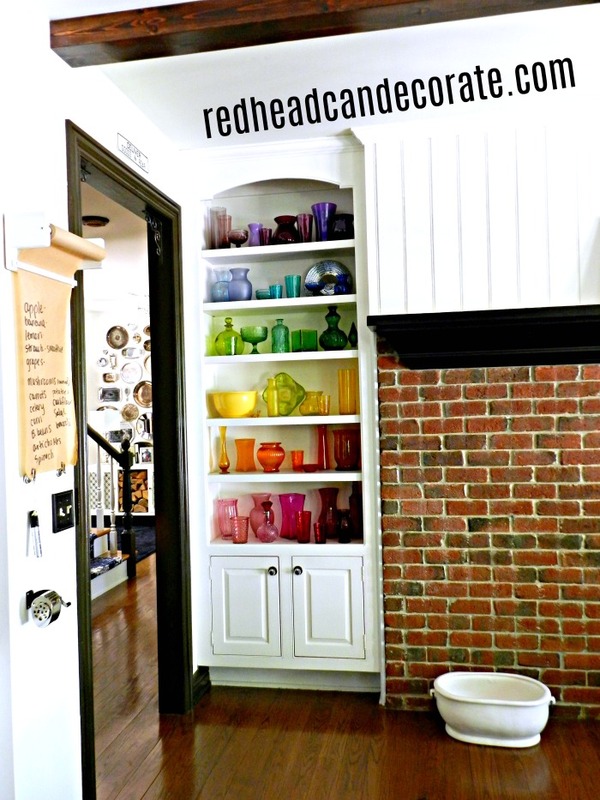 I counted and there are 48 pieces of colored glass on those shelves. I’m turning 48. Coincidence? I don’t think so! Okay maybe, but lets pretend. Now listen. 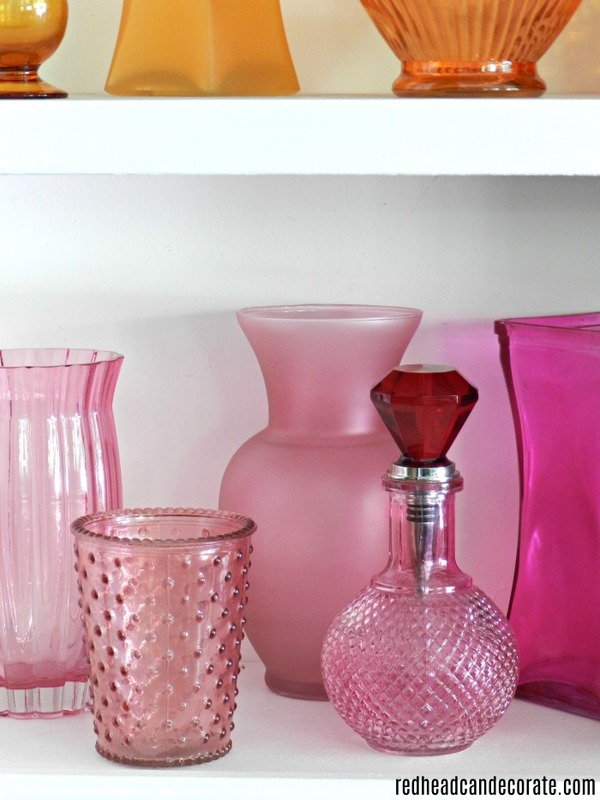 I have a feeling you don’t believe that I found all of these cute colored glass items at the thrift store. Am I right? Well, I have news for you. I did not. HOWEVER, exactly 61% of these colors glass items are from the thrift store. Yes, I actually did the math. This next photo has everything I purchased from the thrift store with a check mark. It is definitely the majority, and I could have found tons more if I really needed to. I was a little worried you still might not believe that the majority of the glass dishes are from my local thrift store, so I took photos to prove it 😆 . Here’s when I was trying to figure out how I was going to display it all. I was very unsure at this point, but I knew it would work eventually. You can see that I was missing the bottom shelf. I had to go find that in the basement once I realized it didn’t look right all uneven. 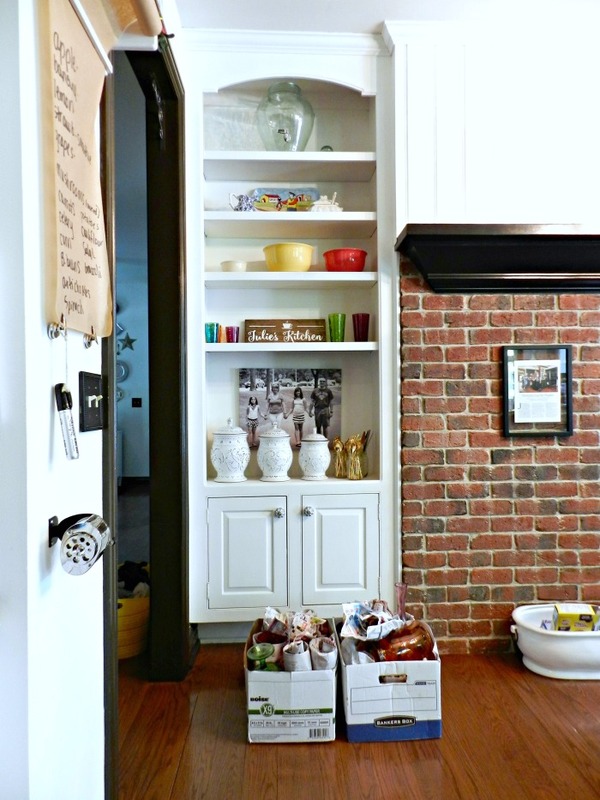 Here’s the built-in shelves BEFORE. I moved our photo to the mantel, and I used what I could like the bowls are still there, but I put them inside the big yellow one. I needed more yellow anyhow. I also used the colorful glass tumblers for fillers and we use those daily, so it’s convenient to still have them there. Here’s more proof. You can see the price tags. I paid $50 total for all of the thrift store glass. Not a bad price when you consider how unique and cool this is. The thrift store worker ladies really thought I was nuts. They watched as I loaded up. I used 1 cart and just studied the shelves searching for every color. I suppose I got lucky, but if you look you will certainly find colored glass at the thrift store. 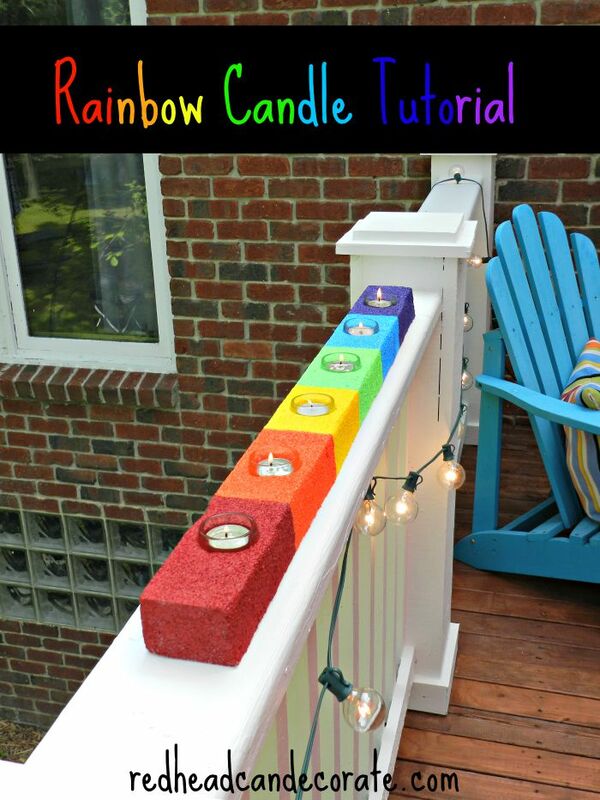 Just one up it by looking for the different shades, too. 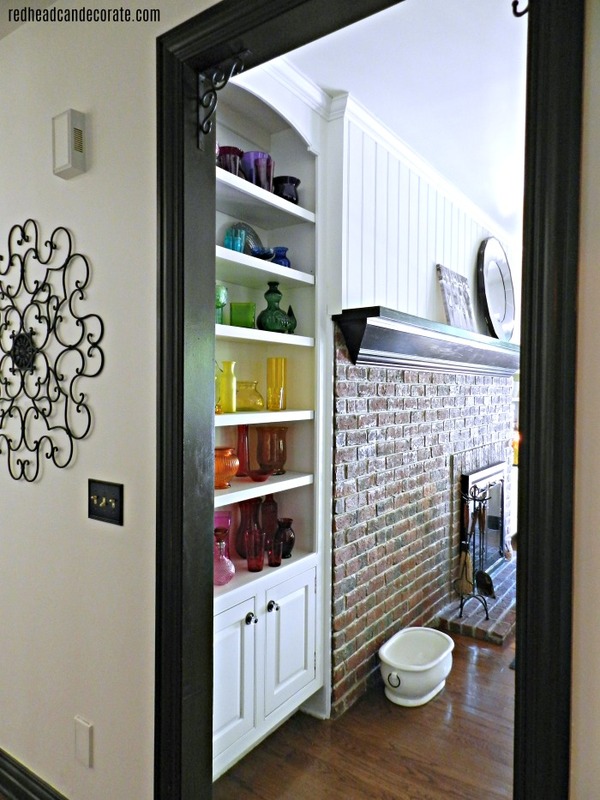 Here’s the view as your coming down the hall from the laundry room into the kitchen. Here are a few close-up shots that really show the “ombre” effect. I started off on the left with the lightest shade piece and finished off on the right with the darkest shade piece. I also followed the rainbow going upward and kept 1 color on each shelf. Some of the pieces didn’t fit correctly like that pretty green one where I had to set the top of it down next to it. I threw in a few funky items that I had like the little glass cat my Mom gave to me, the red bottle stopper that fit in the pink thrift store bottle, and the greenish yellow ashtray that has been in my family for centuries. My sister tries to steal it, but she will never succeed (I wonder if she reads this?). Didn’t the green ashtray come from Papa? This is too cool!!! In love! Thank you, Jessica! I can’t believe how easy this was. Should have done it a long time ago! Have s great Saturday!! I love all the glass. Very eye catching! Made me happy when I saw the post! 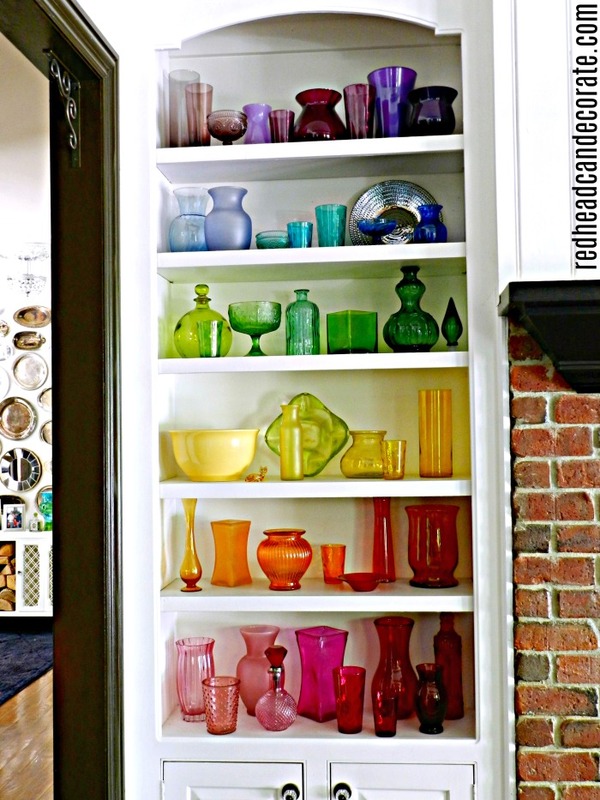 Your shelves look so cool with the beautiful rainbow glass. What a neat idea……you are constantly thinking ‘what next?’ aren’t you?! 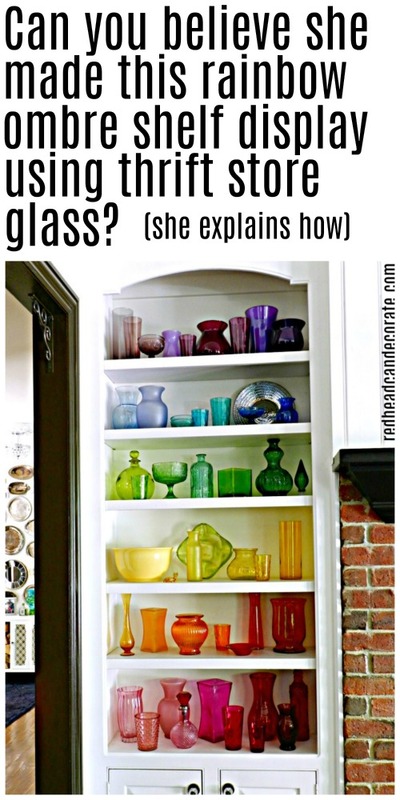 I really think this is a very unique way to display your pretty colored glass. Love ombre!!!! 48 what a coincidence……and the Green Ash try is your age (Dad would know), he’s great and always sending you positive comments! Yes, thank you Carol! It keeps my mind focused on positive things rather than the horrible news. You got those from just one thrift store??!! Will you tell which one? See the boxes below the shelves? They are full of the loot. 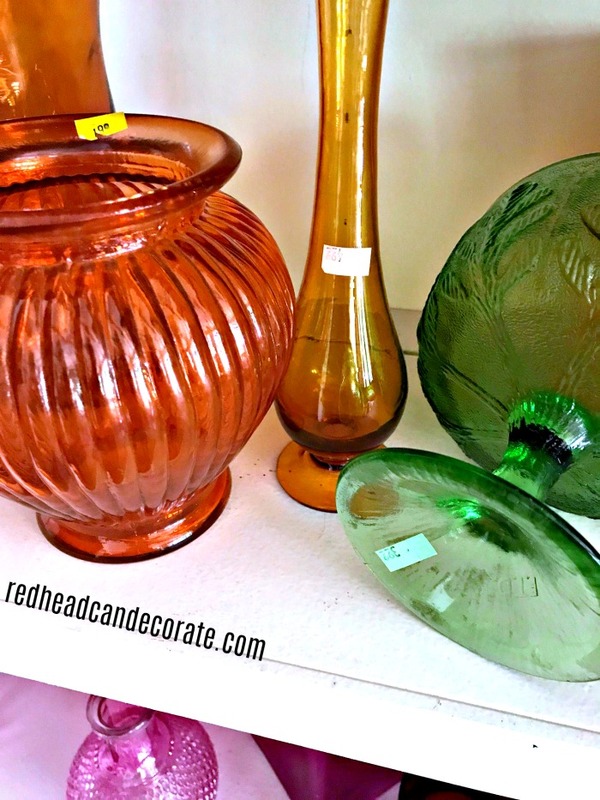 Any large thrift store should hold plenty of colored glass. I’ve seen it at all of them. Hi Tambur! Actually I found the majority in the same thrift store on the same day! The cart was full and the stock woman had to of thought I was nuts. She didn’t even ask what I was up to. She just kept stocking and ignored my excitement ? Yes! I agree, Rust! That is a great way to describe this. I could honestly look at it all day. Thank you!! I also have seen many stained glass items at thrift stores. I only wish I had a place to display them. Beautiful display there Julie; along with your candles and ornaments. Beautiful quote, Colleen! Thank you!! Nice! It is interesting because of the variety of shapes and I love the little kitty that was included and the perfume bottle with knob top! Those are my favorites, too! Thank you!! Happy Saturday Julie, I love it, so colorful and just makes the wall and the room POP. I love rainbow too, it reminds me when I was little and my dad told me all the colors and then would quiz me when we saw one together. LOL. You know me, the Thrift Stores are my go to place before anything. I can of spray paint is then my best friend too. 🙂 Have a wonderful weekend! lady. Love all the glass and the way you went from light to dark. Thanks for sharing.?????? I love the colors, I am always working with the color wheel for setting up china, clothes in closet, so I love this. I really loved it. So much color. I love color! So tired of white, white, neutrals. Me too, Rhonda!! Me too!!! Darn! I moved and got rid of a lot of my colored glass items and after seeing your collection, I will have to hit the thrift stores again and start over. The colors make you feel happy. Oh no!! Don’t you hate that when you go to look for something and then you remembee you sold it. Well, have fun looking! I think you’ll find some easily. Search your cabinets, too! WOW! i LUV it! 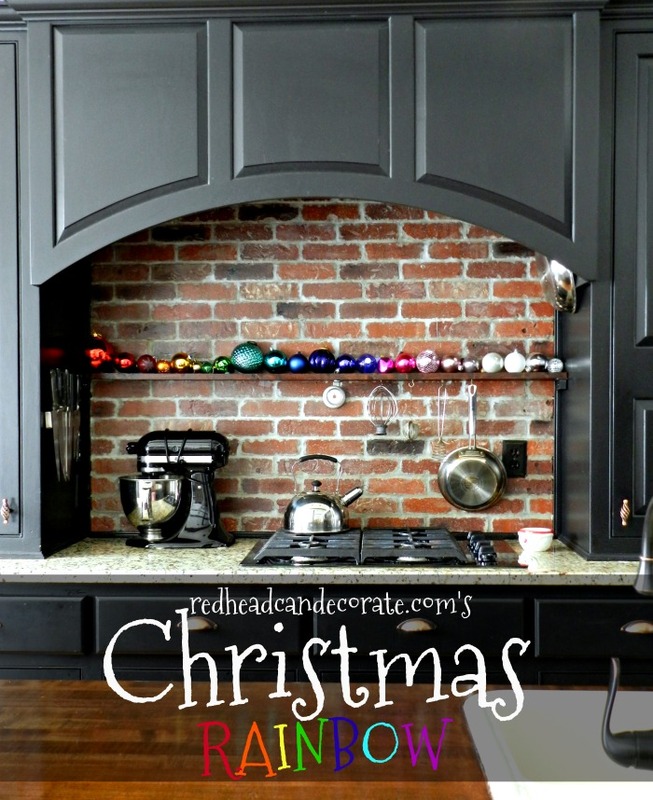 what a fabulous idea and so nicely displayed. 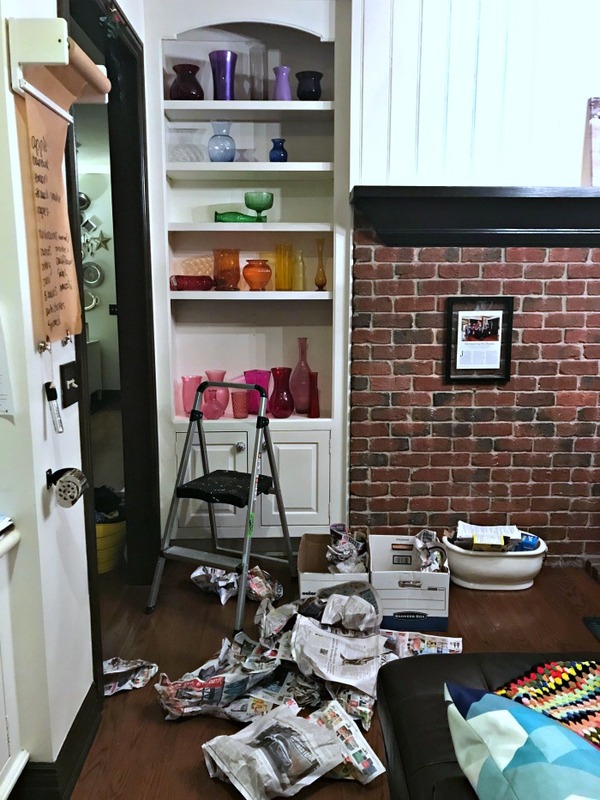 That’s exactly what cabinets like yours are for… to change according to season, freshen a look, or just have fun! This is again so out of the box great idea! After all “Rainbows are Gods promise”. Check and see if that green ashtray glows under black light. If so, it is called uranium glass or vaseline glass. If it glows, it is due to a very small percentage of uranium in the glass. Very collectible. Beautiful display! You’re kidding me. Okay, I will try it, thanks Dee Anna! It sat on my Mom’s end table for years and years. My Dad smoked back then so it was used alot. We use to joke about it being a great weapon if need be! ? Wow, now I know why I like you so much, my birthday was Friday June 23rd. Happy belated birthday to you. I love your rainbow of beautiful glassware. I would have never thought to display glass this way, but I love it. Thanks again. That shelf display is stunning!!!!!!!!??? couldn’t resist!!! Never used this emoji before.. kinda cute though! Your home is absolutely beautiful!! Hi BJ! You have great eyes. That pencil sharpener is my bff. I can’t live without it ? I love this rainbow glassware so much! !